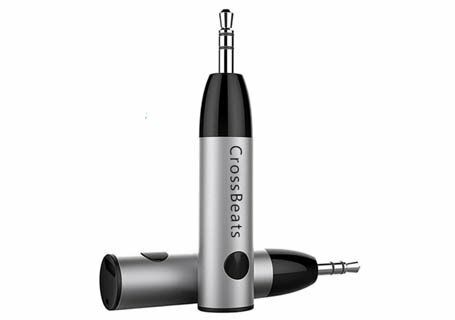 CrossBeats Connect Mini is a useful gadget for streaming music in non-wireless devices supporting Aux cable. It turns a non-Bluetooth TV, PC, CD player, iPod, Laptop, Tablet into a Bluetooth transmitter while pairing with Bluetooth stereo Headphones or Speakers, Ideal for home or vehicle music streaming sound system where you are free to enjoy HIFI CD-like audio quality. It is also one of the best car Bluetooth audio receiver currently available in the market. let's find out more about the product. CrossBeats Connect Bluetooth receiver function transforms 3.5mm audio-out media devices into a Bluetooth device capable of streaming high-quality audio. Mini Bluetooth Receiver is easy to use, Just Plug and Play and it Takes less than 1 second to connect & enjoy. It has latency lower than 95% of other devices including aptX Low Latency technology. end-to-end lag time in this device is about 40 milliseconds (which is nearly negligible) so a high-definition video is transmitted without any trouble. Another feature that can be helpful is its capability to Connect with 2 Devices at the same time. Two Bluetooth headphones or speakers can pair at once so another people in the room doesn't get disturbed, It has Bluetooth Range up to 33 Feet. You need not unplug the device as it is featuring Built-In Mic for Handsfree Calling so you can attempt the call without any problem (Also featuring Noise Cancelling Integrated Chip). The device is very portable and lightweight (10 grams) so there will be no trouble while carrying. The input and output AUX port access designed in such a way that it's easy plugging and unplugging more convenient for use and user-friendly. It takes about 1.5 hours to fully charge the device and which is providing 5 hours working time and continuously streams even while charging. If you find this device interesting and useful check its availability.